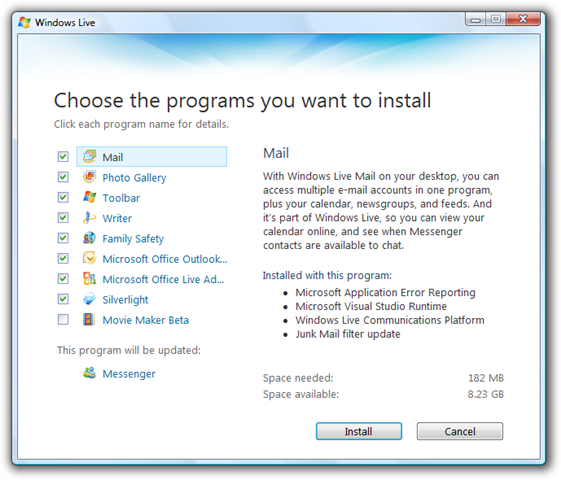 Why is the latest Windows Live Messenger 2009 update forced? As most people who don’t immediately update Messenger have recently noticed, the latest Windows Live Messenger 2009 update is mandatory to all existing 2009 users and not only is it quite a large file, but there’s been no word as to what is in the update and why it is mandatory. Additionally, the update installer itself does not recall which components you elected not to install initially and automatically selects the other applications to be installed. 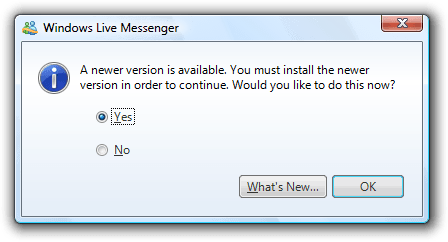 If you choose Yes, Messenger will go ahead and download the Windows Live Essentials installer. If you choose No, you won’t be allowed to sign in. A What’s New… button is provided but it simply sends you to http://download.live.com which doesn’t tell you anything about the update or why it is required. Mandatory updates in Messenger’s history have always been the exception. Updating has generally only been forced to upgrade beta versions to release versions or to eliminate versions which have a major security hole and shouldn’t be being used. Unfortunately there’s been no word as to what’s improved in this forced update, beyond “behind-the-scenes improvements” [Windows Live Team blog]. This 34.4MB file contains the full Messenger installation including the standard components it would install. For mandatory “behind-the-scenes improvements”, this seems a bit too large for me. Unfortunately the installer doesn’t appear to have changed from the original and therefore doesn’t retain your original installation options. So by default, not just your existing applications will be updated, but the installer will automatically select all applications you haven’t previously installed. As the installer already knows this is an upgrade install, it would be great if the additional applications were not automatically selected. As your eyes see the advertisements, both within Messenger and the associated Windows Live properties, you are paying for Messenger. Therefore as a Messenger user, you are a Messenger customer. The fact that this update is mandatory with no given explanation hasn’t gone over well. In fact there’s been quite a few people informing me of their discontent and one person on the newsgroup even went as far as saying they were being “bullied by Microsoft”. Others are using this interruption to take a look at some of the third-party clients just to see if they’re any better. The 34.4MB update is quite large, and on dialup, wireless data and bandwidth capped connections, this is a rather large file to download with no real explanation as to why you need it. Additionally if you’re disconnected or interrupted, you’ll have to download the update all over again from the beginning. Finally, Messenger tends to be included in standard computer disk images deployed against hundreds of computers, especially in some education markets. When there’s a forced mandatory update, all these machines now need to be updated and the disk images altered to include the new Messenger version. Mandatory updates would be far better received if the reason(s) the update was designated mandatory and what exactly the update contains was provided. Additionally, when you install Messenger, Microsoft Update is automatically registered in your system. Surely “behind-the-scenes improvements” could be sent through this way during normal updates instead of a required update when you sign in? Messenger is all about communication and generally performs that function quite well, surely Microsoft can communicate to us the reasoning for these decisions. Posted on February 23, 2009, in Uncategorized. Bookmark the permalink. 2 Comments. Microsoft …you can keep your mandatory update to your self , I’m off the windows live messenger , good by !! !